These marbled twin cuffs in a chic dune color are twice as nice in domed acrylic. 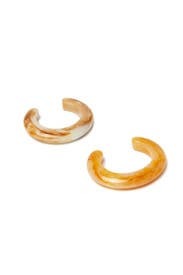 Dune and marbled apricot acrylic domed cuff bracelets. Open backs. 7" in diameter.